Cold pressed Grapeseed oil has 30% less saturated fat than olive oil, making it the highest in essential fatty acid[s] and (76%) linolic acid. With the very high level of antioxidant vitamin E (60-120 mg/100g) this makes it a good source of Omega 6. Grapeseed oil is naturally cholesterol-free and studies reported by the Journal of the American College of Cardiology show it’s beneficial to raising good HDL levels and lowering bad LDL. Grapeseed oil must be kept in a dark bottle to maintain it’s [its] healthy properties. This oil will last twice as long as other cooking oils with so much less oil being absorbed by the food you’re cooking. The oil has a light taste which brings out the flavor in foods. Perfect for light frying and sauteing it can be heated to 485 degrees F with no smoking, producing crisp food without the greasy aftertaste. This oil also makes delicious salad dressings and does not solidify after refrigeration. Please note that I typed this exactly as it appeared on the bottle tag, typos and all. The manufacturer no doubt meant “linoleic” instead of “linolic” acid. What a doozy of an error. If the company can’t even get the name of the “heart healthy” fat in its product spelled correctly, what else is inaccurate? See the image below. Let’s examine this popular cooking oil more closely. Could it be that this conspicuous typo is a Freudian slip indicating a problematic reality? For most of history, winemaking and grape growing regions produced copious amounts of leftover grape seeds, a waste product from making grape juice, wine, and other grape products. While the grape leaves and other parts had uses as foods or feedstuffs for animals, the pits were true waste, with only a small amount repurposed for other uses. While there is some historical evidence for the use of grapeseed oil in both culinary and medical applications, anthropological examination of the diets of ancestral societies provides clear evidence that the primary fats consumed consisted of saturated and monounsaturated varieties (1). Please note that grapeseed oil is not to be confused with rapeseed, or canola oil. Butter, ghee, meat fats, tallow, lard, coconut oil, palm oil, and olive oil were the primary players across the globe. Consumption of polyunsaturated fats, aka vegetable oils such as grapeseed, occurred in very limited amounts. Typically, these fats were obtained naturally via food: nuts, seeds, eggs, organs (supplying critical and elusive gamma linolenic acid), and seafood. Rarely were these highly unstable fats that are prone to rancidity consumed in isolated, concentrated form. As such, the amount of polyunsaturated fats in the diet of traditional peoples was historically quite low. Then came the Industrial Revolution which changed all of that! Factory processing unleashed a whole new type of fat onto the food scene. The age of factory fats was born including corn, canola, sunflower, safflower and so many others that rapidly proliferated. The popularity of grapeseed oil today is part of this modern trend. Only through the application of high pressure and complex, chemically confusing processing can such fats and oils be created. The end result is the taking of natural things through multi-million dollar factories and complex chemical baths to produce an end result that could not easily be duplicated via traditional means. The most important piece of information concerning an edible oil is its fatty acid profile. As alluded to earlier, fatty acids come in three primary groups: saturated, monounsaturated, and polyunsaturated (2). GSO also naturally contains a small amount of vitamin E (9mg or about 19% of the daily value – DV) unless more is added post processing. It is worth noting that other vegetable oils contain higher concentrations of this fat soluble vitamin (3). The fatty acid profile of grapeseed oil is extremely problematic to say the least. In fact, it should have anyone well versed in fats running for the hills! First, it shows that GSO is about 70% omega-6 fatty acids! Astonishingly, the brand in the picture above is even higher at 76% omega-6! This ranks oil derived from grapeseeds near the very top among vegetable oils for omega-6 content. Combine this with its stunningly low omega-3 content (1.5%), and you an omega-6/omega-3 ratio as high as 696:1 (4). This is an extremely unhealthy fatty acid ratio. In fact, grapeseed oil could more aptly be called “heart attack in a bottle”! You see, omega-6 oils have a strong pro-inflammatory impact on our bodies, and the more imbalanced our intake of omega-6 and omega-3, the more disastrous the impact on our health! For comparison, lard and olive oil have omega-6/omega-3 ratios of around 12-10:1, while other popular vegetable oils like sunflower, safflower, and canola oils are around 200:1. The total polyunsaturated (PUFA) content of a number of common vegetables oils show grapeseed taking top place as well (4). So how did an oil like grapeseed with such a pitifully poor fatty acid profile become so popular? It seems two things have propelled the improbable and shocking popularity of grapeseed oil even among health conscious consumers who should probably know better. First, its association with grapes (and thus wine!). Grapes and wine have received a lot of positive press the past few decades. This is due to their various and well deserved health benefits, partly because of the “Mediterranean diet” and partly from many solid studies that show their wide ranging health benefits. Grapeseeds or pits contain none of the nutrients and other beneficial compounds that whole grapes do, such as various vitamins, resveratrol, dietary fiber or other “proanthocyanidins.” Grapes also contain other valuable nutrients like vitamin K, vitamin C, copper and potassium notably missing in the seeds (5). Also, while it is true that omega-6 linolenic acid is converted by animals to the highly valuable CLA (conjugated linolenic acid), this biological process isn’t as straightforward as it seems. The conversion is not guaranteed. Gut health and other dietary and genetic factors play a huge role in whether the conversion happens efficiently or at all. More than likely, excess linoleic and other PUFAs have been shown to contribute to and cause inflammation and other problems in the body. CLA is best found from eating foods that naturally contain it already fully formed. This puts grassfed meat and dairy products at the top of the list, not an industrialized cooking fat like grapeseed oil! 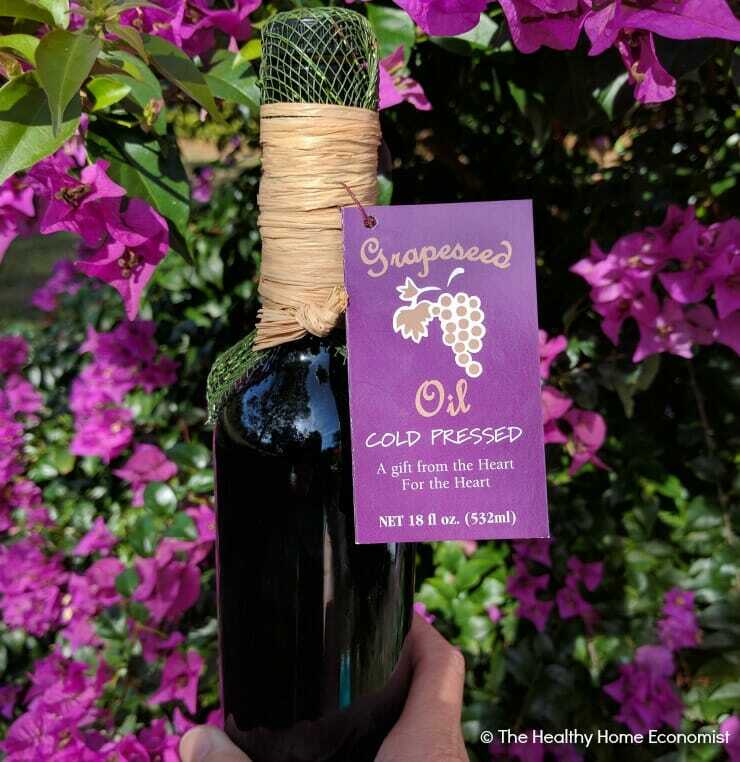 Grapeseed oil has continued to gain popularity because it has a higher smokepoint and a lighter taste than olive oil as well as most vegetable oils. “Smokepoint” refers to the temperature at which an oil begins to break down and form free radicals under the stress of heat. Grapeseed oil can withstand temperatures up to 420°F/ 216°C, higher even than olive oil though slightly lower than most other vegetable oils, like sunflower and safflower (3). In addition, grape seed oil is almost perfectly odorless and flavorless. As a result, it doesn’t alter the taste or smell of recipes like olive, virgin coconut, and many other oils do. This is a highly marketable feature for retail purposes and as an industrial ingredient. Compared to olive oil, GSO is also far less expensive, and thus widely used in processed foods that traditionally contain olive oil – like mayonnaise and salad dressings. Consequently, it is used on various foods, like raisins, to protect their flavor and keep them from sticking together. It makes sense why manufacturers would want to mass produce grapeseed oil. This oil represents a highly profitable revenue stream produced from a readily available supply of waste product. And, by marketing it as a “healthfood”, an unsuspecting public unwittingly buys it up. Mmm. Sounds like another modern day healthfood we all know and (don’t) love – soy! But wait! Isn’t grapeseed oil historical? It is true. Traditional cultures did indeed consume grapeseed oil. However, its classical use differs from modern grapeseed oils in a couple of distinct ways. First, historical people consumed GSO in very small amounts or not at all. Remember, polyunsaturated oils were too difficult and costly to produce in large quantities by hand, and thus were consumed only in very small amounts for those who could afford such luxury items. This is similar to how in some ancient societies, white bread and sugar were the foods of the rich (until factories came along). It took mechanization and cheap energy to make vegetable oils viable for mass production and distribution on a large scale. Second, unrefined grapeseed oils of old were carefully processed and handled, generally by cold pressing and extraction. Such handling ensures that the fragile polyunsaturated fats that are so prone to rancidity remain intact. Modern versions rarely enjoy such careful creation. And, even if they do, it may be weeks or months before they find their way to consumer pantries. By that time, even if packed in dark, glass bottles, some degree of degradation has likely already occurred. When it comes to fats, a simple rule of thumb can really save the day. If humans didn’t make it or eat it before the fossil fuel age, then we shouldn’t either! Before fossil fuels and industrial food, oils had to come from readily available and easy to extract sources. These would include primarily animal fats and plants that produce an abundance of oil that is easily pressed and extracted. Olives and coconuts fit the bill here. But the Industrial Revolution changed all this, unleashing the age of “vegetable oils”. So while PUFAs may be “natural,” they are natural in the same way a Lego block is “natural”. They are nothing more than the end result of taking natural things through complex factory processing to produce a marketable product. Would you eat a Lego? I don’t even like to step on them! So, it seems that we live in the age of the pits. Parts of foods that historically were disposed of, used for composting and considered waste or at best reserved for lower quality, utilitarian applications (like lamp oil) have suddenly become “food” through the alchemy of fossil fuel powered extraction and processing. These are our modern day “health foods”. They are the kind of healthfoods that we actually want to avoid if we want to protect and improve our own health and that of our families! If despite all this evidence, you are resolved to use grapeseed oil anyway, at least make sure you get an organic, cold pressed, solvent free brand! Many manufacturers in the edible oil industry use high heat, high pressure, toxic hexane solvent processes to extract the most oil as quickly as possible with little care for how these processes and impurities impact the final product. And, if you choose to cook with it, at least make sure you are on a diet free of processed foods and low in grains. These foods are loaded with polyunsaturated fats, which risks inflammation issues from overconsumption of omega-6 fats.